Have you made a new year’s resolution? I haven’t yet, partly because I think January is a terrible time to make any kind of life change (way too dark and gloomy) and partly because, as I mentioned in my last post, I’ve been a little bit distracted. But year after year, I see the same reading resolutions cropping up, and I’m pretty sure that they’re never kept. Resolution 1- I will read 52 books this year. A book a week. Perfectly achieveable… if you already read at around that rate and don’t expect to have, you know, life get in the way of your plans if you don’t. You get sick, have a busy week at school or work and the next thing you know you’re behind on your schedule and will start panicking. I hate it when people set numerical reading targets, because for me, reading is meant to be enjoyable, and a pleasurable activity can’t really be quantified in terms of the number of pleasurable items consumed. For example, you might like eating chocolate, but eat too many bars and you’re going to get sick. This doesn’t have to be a book a week either, it’s any arbitrary number that you use as a stick to beat yourself. Just read at your own pace, and love the books you do manage to read. 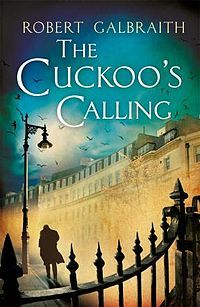 Ah, so you’re going to read that fictional classic that you’ve always felt that you should read but didn’t quite get around to despite that fact that you’ve been promising yourself that you will for the past seven years? It’s all well and good, but are you promising yourself that for the right reasons? My feeling is if the book had really called to you, you would have read it already. If you feel you should read a book, you’re probably doing it because it symbolises something to you, an intellectual achievement, a chance to fit in… not necessarily the right reasons to beat yourself around the head with a 1,440 page dusty tome. If you love classics, fine, but if you actually love dodgy sci-fi with giant spaceworms and bigger plot holes? Do yourself a favour and stick to what you love. Ever fancied reading the unabridged great books? I tried this when I was in sixth form and thought I should educate myself before going to university. I started with Marx’s Das Kapital because I was studying Nineteen Eighty-Four at the time, and I didn’t get much further than that. The thing is, many of these great political/philosophical works are pretty esoteric or are deeply rooted in their time, with obscure references to people, works and ideas which you may not have heard of or which are very much of their time. Do yourself a favour and if you are going to try this, either go abridged or get a good academic guide which is going to offer you some context. Ever heard the expression that you can take a horse to water but can’t make it drink? Well in my house, the horse only drinks sports drinks… if you follow the analogy. Best of luck in your own house though! What New Year’s resolutions have you seen or made that have struck you as being overly ambitious? This entry was posted in Uncategorized and tagged 2014, books, life, new year, reading on January 5, 2014 by Siobhan. Image based on an original by Jain Basil Aliyas under the terms of Creative Commons license. I loved Frobischer’s character in David Mitchell’s The Cloud Atlas. Everything about his characterization was perfect but I loved the “A half-read book is a half-finished love affair” line. I think it’s something every reader can relate to. Unless the book was by James Joyce, in which case it was almost certainly a dead-end relationship and you’re better off without it…. I will try reading Joyce’s books again one day. But I will need the world’s biggest cup of tea and a huge plate of biscuits to hand. This entry was posted in Quotes and tagged books, reading on August 16, 2013 by Siobhan. 1000 novels that everyone must read? A friend sent me a link to this reading list on The Guardian billed as “1000 books that everyone must read a definitive list” telling me that it made her miserable because she hadn’t even heard of most of them. Granted that these lists are supposed (I suppose) to be a little aspirational, but it does make you wonder who decides what should be included on these lists. The Guardian’s Review team and a panel of expert judges apparently. It’s not really an Everyman’s List, and it’s interesting to see that a lot of the “100 Best Books” titles seem to have been left off in favour of a disproportionate amount of the Amises, Perec and Smollet. Which instantly gives you the impression that the panel weren’t looking at populist fiction. I’m beginning to fear that a lot of these lists are designed to allow a select set of individuals to preen their intellectual plumage rather than offer suggestions for great reads for the rest of us. This entry was posted in Direct Speech and tagged books, entertainment, reading on July 7, 2013 by Siobhan. I dream of having eyesight good enough to forget my glasses, but really liked this idea that I saw when we went for Sunday dinner in a local pub called The Greyhound recently. 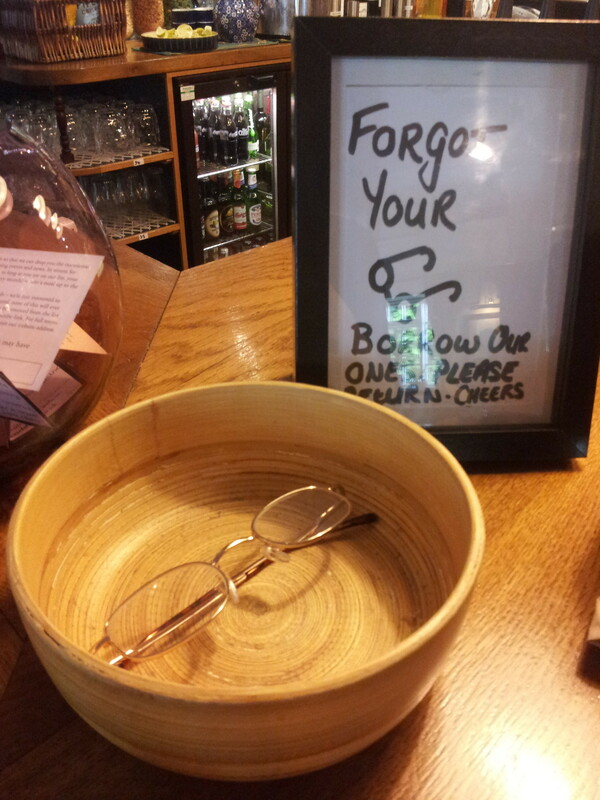 Patrons who forget their reading glasses can borrow a pair from the bowl to allow them to enjoy their book/paper while they enjoy their drink or wait for their meal. Perfect! This entry was posted in Fun Stuff and tagged books, food, glasses, reading on July 3, 2013 by Siobhan.